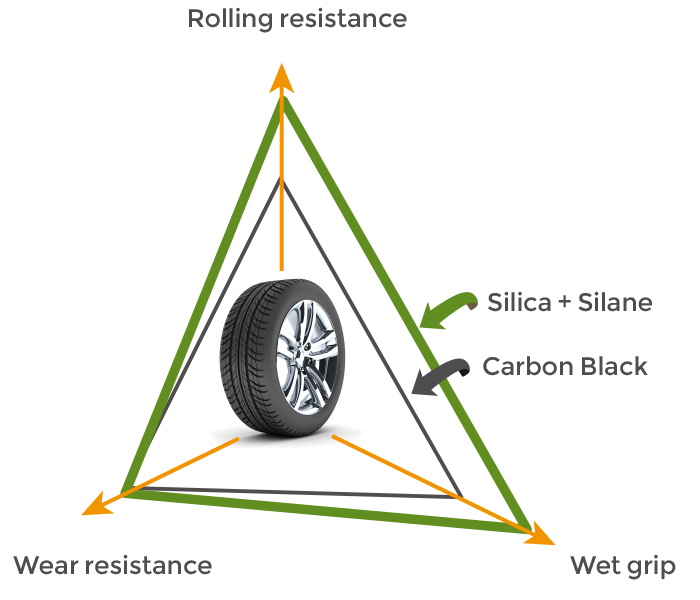 Generally high surface area, high structure carbon blacks are used in tread compounds because of their outstanding contribution to wear resistance. The downside of these kind of blacks is their poor dynamic performances (Fig. 2). The substitution of some carbon black with silica-silane provides a commonly adopted solution (Fig. 1) – however the “silica-silane” solution is relatively costly compared to using carbon black and is problematical with regards to processing (e.g. multiple mixing steps required, wear and tear on processing equipment). A tire sidewall is designed to resist the attempts of vehicle drivers to destroy their tires by inadvertently driving into road curbs or by neglecting to ensure that their tires are inflated to the prescribed pressures! Important characteristics of sidewall recipes are abrasion/wear resistance as well as resistance to chip/chunking (low-frequency forms of abrasion). As kinetic energy is lost to heat dissipation on every revolution that a tire makes due to cyclic flexing, it is also important that the compound exhibits an optimal balance between mechanical performance, hysteresis and flex fatigue. It is well known that flex-fatigue is negatively influenced by the presence of grit (oversize particles) that is often present in (un-milled) furnace carbon black grades. As Black Bear mills all of its products to very fine particle size distributions (e.g. 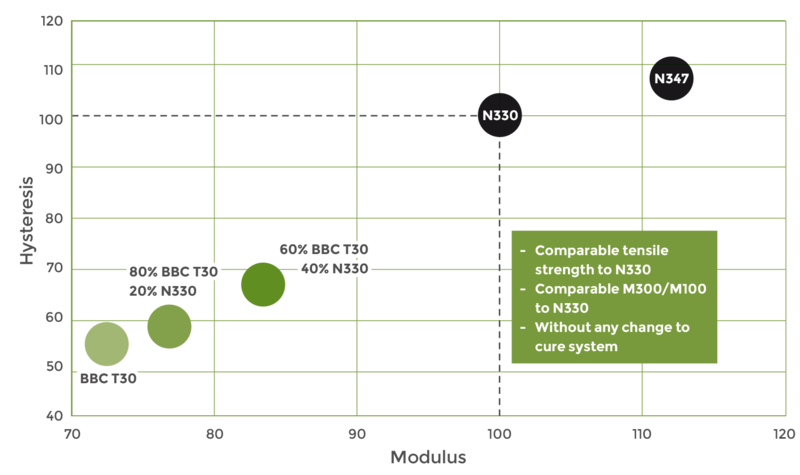 BBC T30(S) milled to D99 < 3μ; D50 < 600nm), there are no oversized particles present – so it’s completely grit free. Low reinforcing blacks (e.g. N772) are commonly mixed into halobutyl rubber (e.g. BIIR) for their low modulus/hardness, low hysteresis and contribution towards low gas permeability. Mechanical performance is clearly less important. Although the Black Bear products have much higher STSA surface areas than N772, their very low effective volume fractions may provide an opportunity for either a full or partial substitution with BBC T30 or BBC T30S. It has been shown in several non-tire applications (e.g. anti-vibration mounting) that a full substitution of N772 with approximately 15 – 20% less BBC T30 significantly reduced the Payne effect at comparable hardness.